After the Great Hanshin-Awaji Earthquake, we investigated and studied the technical problems of life-saving rescue equipment. At that time, we became acutely aware that it is very important for us not only to conduct continuous research on equipment for life-saving and rescue operations but also to educate people across generations on these topics. Given this background, we proposed the Rescue Robot Contest as a way of passing on technology and developing human resources, aiming at the major goal of expanding rescue systems and making the world resistant to disasters. Events like robot contests can be evaluated based on three aspects: "Education," "Sociality," and "Science and Technology." First of all, by holding Rescue Robot Contest, we can provide opportunities and places for nurturing creativity, just like conventional robot contests. Moreover, teams can deeply examine disaster relief, prevention, and reduction through their participation in the contest. Even the people watching the contest will be exposed to increased awareness about disaster prevention and reduction. Additionally, we hope that unique ideas for rescue that even expert researchers and engineers could never have come up with will be created by the participating teams. In this way, ResCon includes all of these three elements and all elements are connected together by a core concept of ResCon, "kindness." Of course, there is a big difference between real rescue scenes and the contest setting that we have arranged here, and we do not expect that practical rescue technologies will be created immediately through this contest. However, we believe that we can provide many opportunities to think about the importance and difficulty of rescue operations to many people through engaging in such a contest. We believe that finding even only one "shining idea" that is truly useful among 1,000 ideas would be a great result. The contest is set at the "International Rescue Engineering Institute" (fictional laboratory). Here, advancement of rescue equipment and operation technologies are undertaken in a contest format for the evaluation and training of rescue-related technologies. Several rescue dummies (Damiyan) simulating victims have been placed beneath the debris. Damiyans may be buried under the debris. Since nearby debris on private land might be someone’s property, it must not be damaged nor climbed over thoughtlessly. To prevent secondary disasters, humans are not allowed to enter the area. Instead, remotely-controlled rescue robots are go! 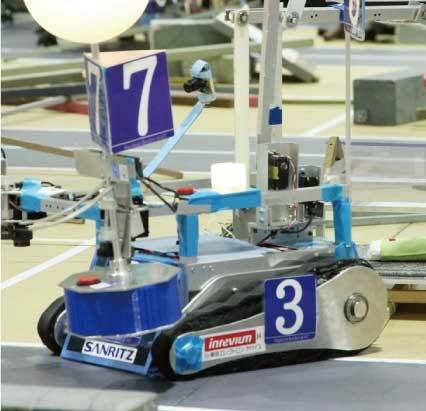 It is the team’s mission to search for dummies by removing the debris and obstacles, gently help them out from the debris, and carry them back to a safe place as soon as possible, based on the images sent from the robots. Each team has to launch their robots from the robot base and rescue three Damiyans by using them within the allotted rescue operation time. The Damiyans are embedded with sensors to detect any rough treatment. The operators must control the robots remotely from the control room, relying mainly on the images from the cameras mounted on the robots. In the contest, an important criterion is not only how quickly the Damiyans have been rescued, but also how gently they have been treated . Damaging the field or Damiyan, or dangerous actions, etc., will be treated as fouls based on the judgment of the referees. Fouls are classified into three levels; "Yellow flag” (warning), "Red flag” (ejection), and "Black flag” (disqualification). Penalties corresponding to these flags are temporary suspension of the rescue activity (yellow), ejection of the corresponding robot or corresponding person (red), and disqualification from the rescue activity (black). If a yellow flag is issued two times to the same robot, it is treated the same as a red flag. Two teams start the rescue operation simultaneously from the both sides of the experimental field. The field contains slopes, high ground areas and other obstacles, and three Damiyans must be rescued from the debris and be carried to a safe place (robot base) by using robots alone within the time limit. Presentation Teams present the characteristics of their team and the features of their robots as well as the concept of their rescue operation. Briefing A briefing is held immediately before the rescue operation to plan the rescue strategy based on the available information such as the images from the “Heli-tele” (ceiling camera mimicking a helicopter camera giving a bird's eye view). Rescue Operation Operators perform the rescue operation relying only on the camera images. The experiment field is separated from the control room by a shield wall, and the team members control the robot remotely from the control room. The experiment field has several areas, each of which consists of several sections where various debris is scattered. The debris includes a special type that models a collapsed house covering the Damiyan. 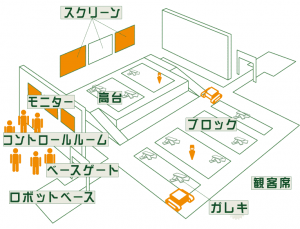 A Damiyan is placed in one of these sections and the team has to discover and rescue the Damiyan from that section. Multiple pieces of debris may be arranged around the Damiyan. The roads may have uneven sections that the robots have to traverse and the robots might have to pass each other on the roads, requiring high performance in terms of mobility and skilled control by the operators. The robot is equipped with onboard cameras. The operator cannot see the experiment field directly but has to control the robot remotely through wireless communication, relying only on the camera images. Besides the onboard cameras, a ceiling camera mimicking a helicopter camera called “Heli-tele”is installed in order to capture an overall image of the field. 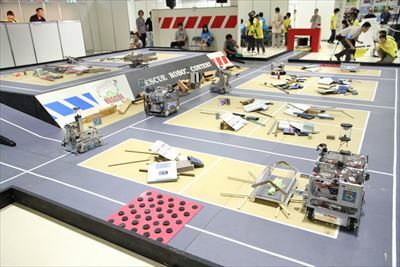 The robots wait on stand-by at the robot base before the competition starts, and then take their own route in the experiment field simultaneously after the start. A Damiyan is a dummy with a soft body made of sponge with a height of 20 to 30 cm, simulating a victim. Pressure and acceleration sensors are embedded in the body and signals from these sensors are transmitted with radio waves to the computers located outside the field. The levels of pain and discomfort are calculated based on these signals and displayed on the Damiyan indicator screen. The physical points for each team are evaluated from these values. Each team must rescue three Damiyans in each mission. Assuming that the teams are asked to diagnose the victims remotely, each Damiyan has individual properties such as weight, beep sound, eye color, and matrix barcode on the chest. The indicator displays real time information during the contest. A larger image will be displayed when you click. Physical Points This score shows the physical strength of the Damiyan. The score gradually decreases over time and decreases further every time when the embedded sensors in the Damiyan detect continuous or impulsive forces. This score is evaluated for each Damiyan and the initial value is set at 100 points. Mission Points This score shows the degree of achievement of the rescue operation. Certain points are added when rescuing a Damiyan from debris has been completed (“completion of rescue”), carrying a Damiyan to the robot base has been completed ("completion of transportation”) and identifying an individual Damiyan (“individual identification”) has been completed, respectively, and the maximum score is 50 points for each Damiyan. Teams, robots and members who have achieved excellent results will be recognized with the following awards. 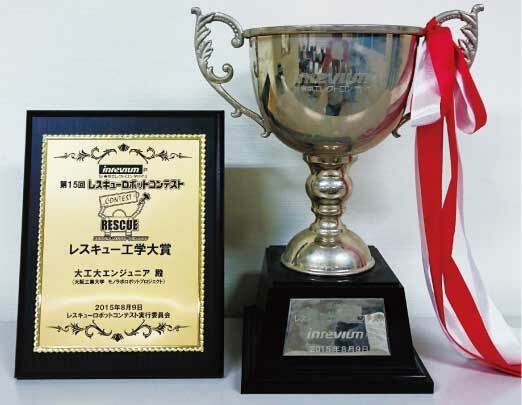 This prize is given to the best team from the viewpoint of rescue engineering by evaluating overall quality and performance of their "Concept," "Technology," and "Organization." "Concept" The team concept along with the ResCon scenario and their ideas of robots to realize this concept shown will be evaluated based on the philosophy of ResCon. Their concept and ideas which are shown in the submitted documents and their presentation will be evaluated based on how clearly they explain their concept. "Technology " The technical capability of the team for making robots and realizing their concept will be evaluated as well as the actual performance of their robots. The number of “restarts” and the number of “foul flags” will be taken into account in the evaluation. "Organization" Organizational capability of the team including managing systematic robot development production, teamwork during their rescue operation, and cooperation with the other team will be evaluated.